I hope everyone had a nice Memorial Day holiday! We took off and had a fun adventure. We stopped at Jason Stephens winery and sampled their wines (came home with a nice bottle too), went to visit family, watched the new Pirates of the Caribbean movie, had a picnic in the park and just relaxed. The weather has been awfully windy which makes it a bit cool around these parts for end of May. But that said, the weather seems to be doing good things for my garden. I had planted lemon thyme a couple of years ago and it had completely taken over a corner of my garden plot so I had to cut that one way back to make room for some new seeds. I planted cucumbers, carrots, basil, eggplant, beets, squash, pumpkin and lettuce. Hoping that the seeds I planted will sprout and grow. Already my peas, beans, tomatoes and the random sunflower are doing well. Nothing like digging my hands into the earth to help make me feel grounded to nature and all it's beauty. 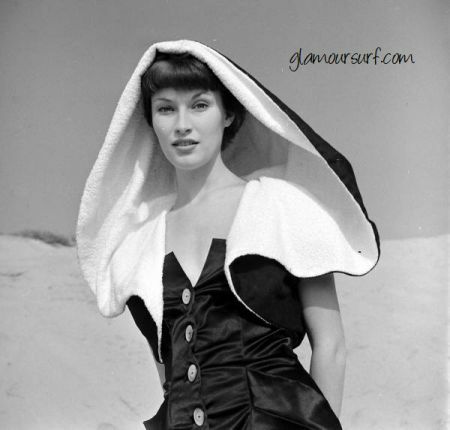 So today it's back in the saddle and time to list more vintage swimsuits. Here's a sneak peek at what's coming soon to Glamoursurf. 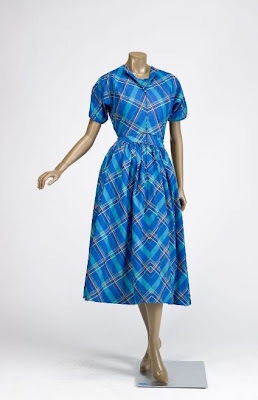 The Indianapolis Museum of Art has some recent acquisitions on view, including a sublime playsuit with coordinating skirt and jacket by none other than Claire McCardell. You must know by now my love for Claire's designs, I am still swooning at this gorgeous set. Front and back views of the playsuit. Dated about 1950. The IMA website has more images of this beauty, I encourage you to go see it. I love how Claire has played with the lines in the fabric and the tailoring of the silhouette to accentuate one's figure, while the design remains relaxed and yet refined. And then, well we must have a skirt to complete the ensemble, THUD! Thank you Claire, I would've loved to have known you. Each time I see one of your creations I feel I get to know you just a bit more. And thank you IMA for sharing this lovely confection. OK, got time to get sucked in? Want to see more? 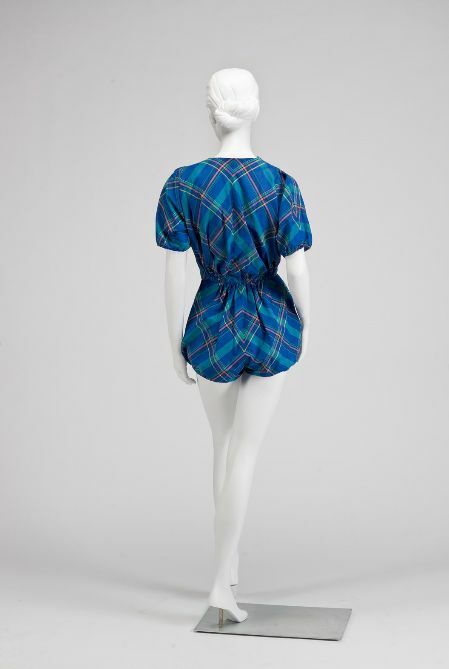 There really some beautiful pieces in the collection like this Azzedine Alaia. Go grab a cuppa. As early as the 1930s, two piece swimwear started to appear on the beaches and in fashion magazines. During the 1930s fitness also became fashionable; swimming, diving and exercising became requisite. Sun tanning also came into Vogue. 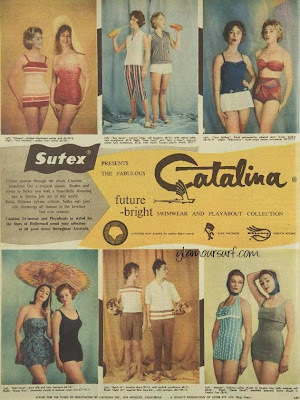 Swimming costumes became smaller and more revealing than their predecessors, new forms of fabrics were being introduced which helped to slenderize the wearers look. The bathing maillot was 'summer underwear', the basis of most summer beach and bathing combinations. Some costumes were still two overlapping pieces, but most popular were all in ones. 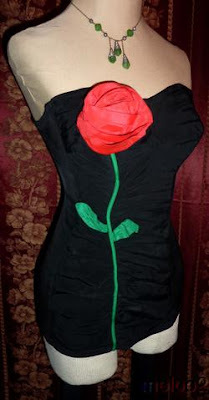 The top of the costume was increasingly low cut at the front and lower still at the back. 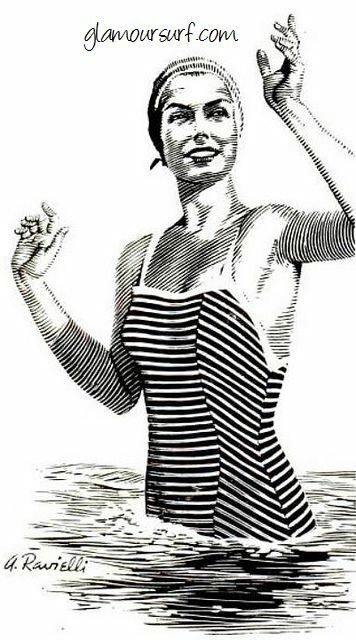 During the mid 1930s, much effort was put into designing a costume which allowed maximum exposure to the sun and yet maximum comfort while swimming. Cross straps, which could be removed while sun bathing, became popular on low backed suits. 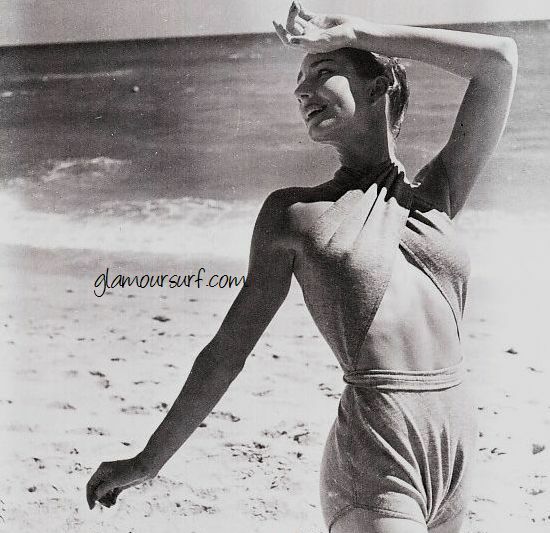 It was in 1935 that the first images of two piece swimwear were seen in fashion magazines. Some adopted this two piece style, but the bared midriff did not become a fashion essential until 1940. 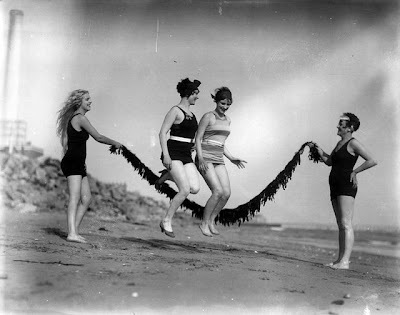 Other forms of beach two-piece were high fashion in the 1930s. The versatile playsuit or beach suit had ousted beach pyjamas from their popularity. This could consist of loose trousers to wear over the maillot, or little skirts or shorts, gathered or wrapover for walks along the promenade or to the shops. All these beach and bathing coordinates came to be tailored like street clothes as 1940 approached. Maxine Jennings in a two piece swimsuit featuring shorts with a zipper pocket, 1936. Lyda Roberti's bold print sarong features matching sandals, 1934. Inspired by the Tahitian natives, this suit was called the "Pareo Tahitian." Karen Morley, in a wool two-piece at Palos Verdes in 1936. Joy Hodges in a bronze lastex with seaweed pattern print in blue, green, and white. 1938 at the El Mirador in Palm Springs. Elizabeth Russell in one of her early publicity shots, models a daring cotton three-piece swimsuit, 1936. Ann Rutherford in a wool two-piece for a Newport, California photo shoot, 1938. Anita Page wears a suit made of bandannas tied together, 1930s. Yes, it's Claire's Birthday today. Claire was born in 1905 and would have been 106 had she still been with us today. Claire passed away from cancer at the young age of 53, far too young for such a talented visionary. Happy Birthday my dear Claire, you have my heart every time I look at your stunning work. All of her effortless ease and innovations in styling still remain top of class today. You can see quite a few of our blog posts on Claire McCardell here on our blog and our friend Lizzie has written a lovely bio (with images) on her website Fuzzylizzie. I also recently come across another post on CharlotteMoss' blog where she has a full copy of the article on Claire that ran in Time magazine from May 2, 1955. Suggestion, go get a refreshment to sip while you take time to read it. "Charlotte will attend a private birthday party hosted by Dr. Valerie Steele in the archive at the Museum at F.I.T. on Monday, May 23rd to celebrate Claire McCardell’s birthday. Guests will have the special opportunity to view 5 examples of the designer’s work that are part of the museum’s permanent collection. *Charlotte will be taking photographs at the event. Stay tuned for Monday night…"
YIKES! You can bet I'll be looking forward to that! In the meantime, raise your glass to one of my all time favorite hero's Claire McCardell. Both of these photographs were shot by Loomis Dean in 1950. But nothing could be finer that the little cover up capelet she is wearing. Isn't it adorable? Janet Leigh in the late 1940s. What the archive doesn't tell you is that this suit is by Cole of California. 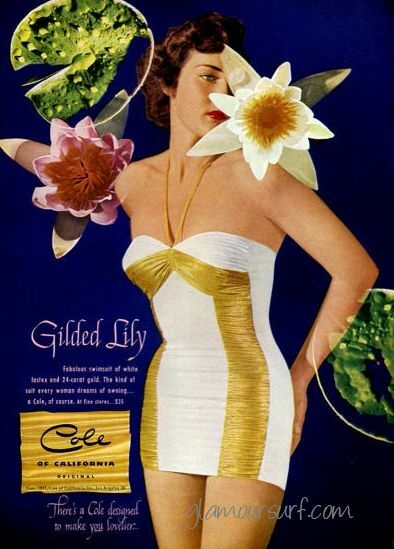 The Cole of California ad below shows the 'Guilded Lily' and dates to 1951. Hmmm, I'm wondering if this was a publicity shot or for use in marketing the swimsuit. The swimsuit is made of white lastex and 24K gold. Clearly Janet was wearing something spectacular and worth it's weight in gold prices today! The ad image above is by Skol from 1950. 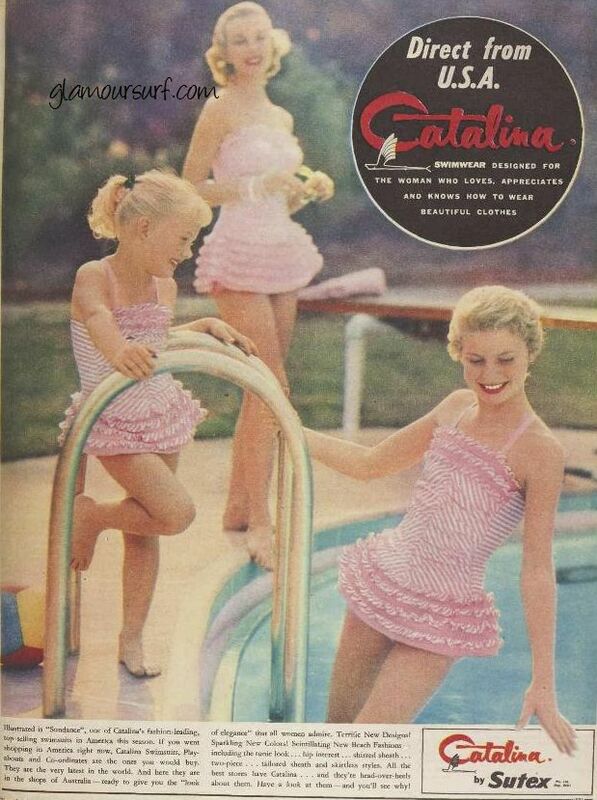 I would swear that the cute swimsuit the gal has on is by Claire McCardell. The image below is a wool jersey swimsuit by Claire McCardell from 1945. 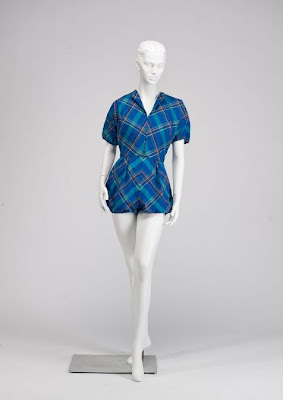 And this cute checked suit is also by Claire McCardell from 1946. The similarities on the bottom portion of all of them are spot on. Love them all! Colour sweeps through the whole Catalina collection like a tropical sunset. Shades and styles to flatter you with a beautifully slimming line in fabrics just out of this world. Knits, Helanca nylons, cottons, failles and pure silk shantungs all feature in the loveliest line ever created. Illustrated is "Sundance", one of Catalina's fashion-leading, top-selling swimsuits in America this season. If you went shopping in America right now, Catalina Swimsuits, Play abouts and Co-ordinates are the ones you would buy. They are the very latest in the world. And here they are tn the shops of Australia - ready to give you the "look of elegance" that all women admire. Terrific New Designs! Sparkling New Colors! 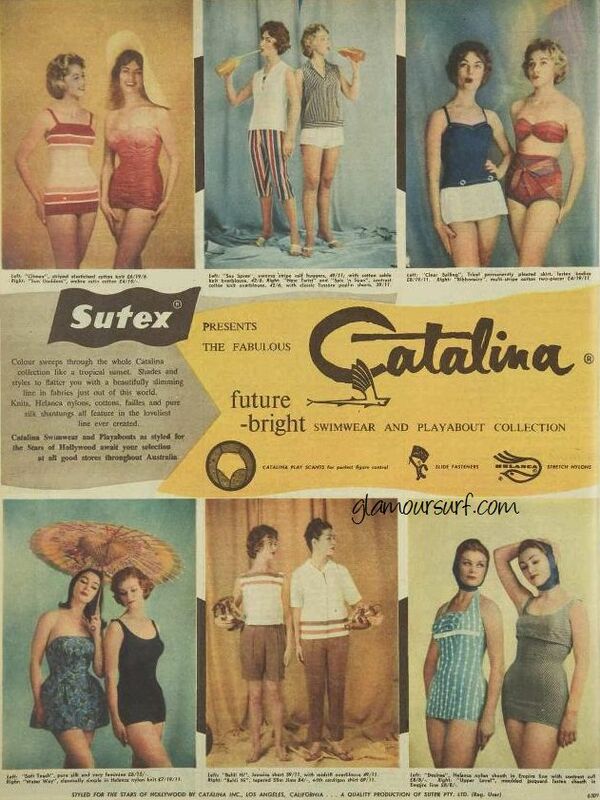 Scintillating New Beach Fashions - including the tunic look ... hip interest... shirred sheath ... two-piece . . . tailored sheath and skirtless styles. All the best stores have Catalina . . . and they're head-over-heels about them. Have a look at them - and you'll see why! I find these ads fabulous. They come from Australian Womens Weekly. It's interesting to read the text and note the cultural differences in talking about swimwear. What's also interesting is Sutex. They must have been a store or swimwear manufacturer/distributor? They are presenting the first two ads and the last one here below is by themselves. Anyone know? Visiting the International Swimming Hall of Fame. They are celebrating "Fort Lauderdale’s Centennial Celebration of Swimming and Diving." The Public Grand Opening Event will be held on Thursday May 5, while the exhibit portion of the celebration will run through October 31st and is free during its first weekend, May 7- 8. As part of the exhibit Jantzen will showcase a sampling of their iconic pieces throughout the decades in conjunction with the Swimming Hall of Fame’s own historical pieces. 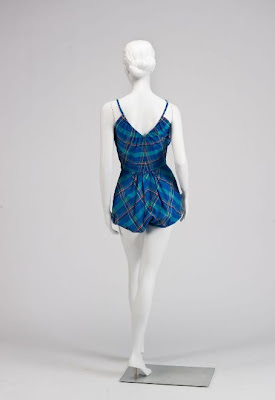 Jantzen will have various key exhibits showcasing the change in swimwear over the past 100 years. The main display will incorporate archival suits from 1921 to 1980, including suits worn by Marilyn Monroe and Jane Russell. A second display pays homage to President Ronald Reagan who wore Jantzen throughout his life. Reagan, who, like the city, was born in 1911, was a lifeguard and swimmer and ISHOF Gold Medallion recipient in 1988. A third swimsuit display that features suits from the “Where the Boys Are” film will be available for viewing. 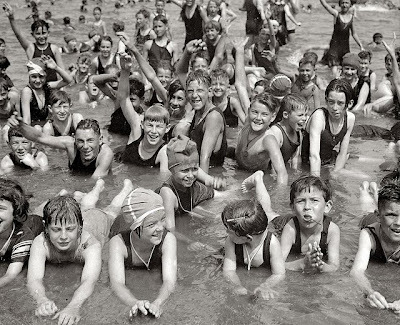 In collaboration with the Fort Lauderdale Historical Society, the exhibit will also include a picture history of Fort Lauderdale’s famous beach when it was the location of a Fort through the origins city pools, Spring Break, Jim Crow segregation, integration and the swimming hall of fame. There are also walls honoring the city’s famous aquatic athletes and celebrities who have visited the Hall of Fame from around the world. Another exhibit, sponsored by Recreational Design and Construction of Fort Lauderdale, presents the evolution of the Fort Lauderdale’s Casino Pool to the International Swimming Hall of Fame as it is today and may be in the future. The museum is located at One Hall of Fame Drive, Ft. Lauderdale, FL 33316. Then I'd head to Miami to go to the Swim Show & newly added Lingerie Show at the Miami Beach Convention Center to be held July 16-19. From what I've heard this is the show to go to for the industry in the US. I think I need to get a little more creative in how I'm saving my pennies. 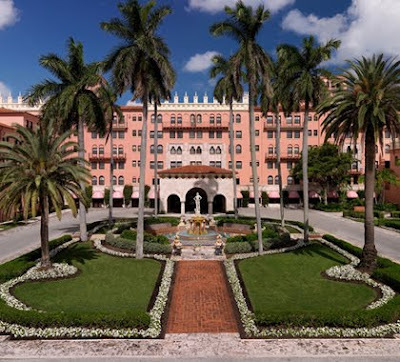 Hmmm, perhaps I'll win the glamourous giveaway Jantzen is having, a chance to win a 3 night stay at the Boca Raton Resort & Club including roundtrip airfare. Now that would be fabulous! What would you do in Florida? 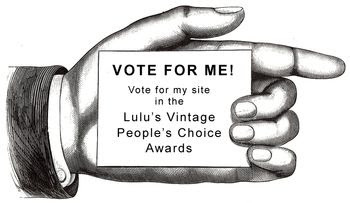 Glamoursurf has been nominated in Lulu's Vintage top 10 Vintage clothing websites. We're honored and very excited about this and YOU have the chance to help us be selected as one of the 'top 10' in her People's Choice Awards. Voting for the People's Choice ends Tuesday, May 31st. The winners of the People's Choice and her personal Top 10 will be announced on Friday, June 3rd. 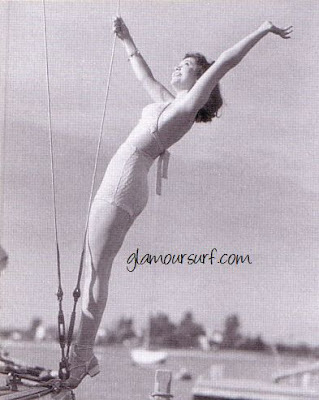 We'd love to ask for your support by voting for Glamoursurf as part of your vintage choices. You can see the full line up of vintage sellers and cast your vote here. 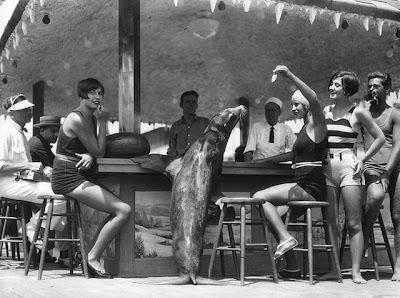 I found a lovely grouping of vintage seaside photo's sets on flicker. I'll share some of my favorites, I kept getting lost in the 1920's. Not a bad place to be at all! 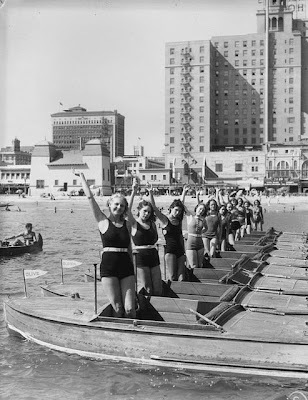 Bathing beauties wave as they stand in paddle boats lined up in a row on the bay in Long Beach during the 1928 Pacific Southwest Exposition celebrations. On each paddle boat is a flag with the name of the bathing beauty. The tall building behind them is the Breakers Hotel. Go out and have some fun frolicking in the sun today! We posted this image on Friday and asked a trivia question: which Brand it is and from what year. The answer is 1953. Does that surprise you? How about the fact that it's Vanity Fair? Vanity Fair introduced the leopard print into their lingerie line in 1953, which became a favorite with customers. 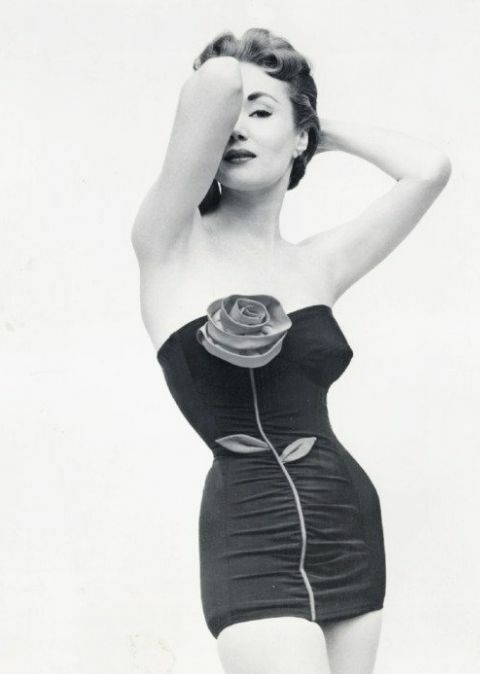 Other innovation to Vanity Fair in 1953 included the launch of Shevelva, a new type of light, velour type nylon tricot fabric. Other popular prints introduced int he fifties included the mermaid, butterfly and zebra. These bold and unusual patterns helped Vanity Fair transform underwear from dull necessity to appealing fashion accessory. The Vanity Fair Crest was also introduced in 1953. The design incorporated the cameo, the original symbol of Vanity Fair and a small Pennsylvania-German design, in recognition of the companies original location. Feathers interlaced with ribbons and pearls, along with a stylized camellia flower, representing the full flower of the South. The center of the elaborate design contained the Vanity Fair monogram and the company signature appeared at the bottom. An in house publication noted the plumes at the top reflected the "consistent and tireless effort to achieve the Best and most Beautiful, and to do it with a light tough and a sense of drama."